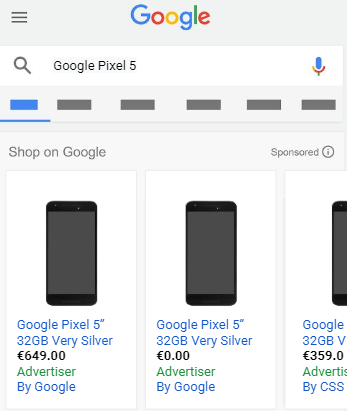 Google have made a few small changes to Shopping ads User Interface for specific products in the telecoms industry. For these products, Shopping ads will now require additional information to be shown to viewers like the number of months and the repayments charge per month. Up until now there has been no easy way to provide the user with this info straight away. 2 offers with differing prices could be displayed for the same phone without service contract and installment information - making it misleading for the viewer and leading to bad advertising performance (see image below). The hope here is that by giving viewers more information straight away about what the product is and its pricing structure should offer a better user experience, and potentially lead to better qualified clicks for the merchant. If you sell a phone bundled with either a service contract and/or with a payment installment model, you also need to state in the title that a product is sold with a service contract and/or installment plan (see image below). What is required of telecom industry merchants? Do you have any questions about these changes? If you want to find out more about whether it could affect you and what steps are needed on your part - please reach out to us at any time.